Experience the power of Moroccanoil, a revolutionary styling, finishing and conditioning product. Instantly absorbing, Moroccanoil Oil Treatment helps eliminate frizz, easily detangles your locks and provides long term conditioning for added bounce. A wondrous multi-tasker, Moroccanoil Treatment helps to soften thick and unmanageable hair, helps build flexible strength, restores the shine and softness to once dull, lifeless looking hair and even protects against environmental damage. If your hair’s been damaged by colouring and styling or you have hair extensions, this product is for you. The unique quality of instant absorption allows it to impart instant shine without leaving an oily residue. Why is this treatment oil so special? Its a very light hair oil treatment that helps add natural looking weightless shine to all hair types. Moroccanoil has the added feature of nourishing your hair at the same time as making your hair look and feel amazing. It protects the your hair from environmental issues such as the suns UV rays and general air pollution, it also helps restore and keep your hairs natural shine factor. Great when used with coloured or chemically treated hair types to restore that essential shine and prepare the hair for your next treatment. The good news is that this amazing oil can be used before or after blowdrying. If used before it helps reduce drying time by up to 50%. Ideal for: All hair types. 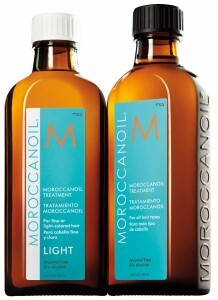 Shampoo with Moroccanoil shampoo and conditioner to suit hair type. Place no more than a 5p amount of Moroccan oil into the palm of your hands and then work through the mid lengths to ends you can add more if desired. For more fantastic lightweight shine you can apply a little more after drying.